The end result was better than I would have hoped for. Bursting with flavour and pack with delicious meat and vegetables, this really is a fulfilling evening meal. Best of all, its incredibly easy to put together. I buy my steaks from Aldi usually and (after removing the fat), find the portion size left per person lovely and generous, especially for the price. 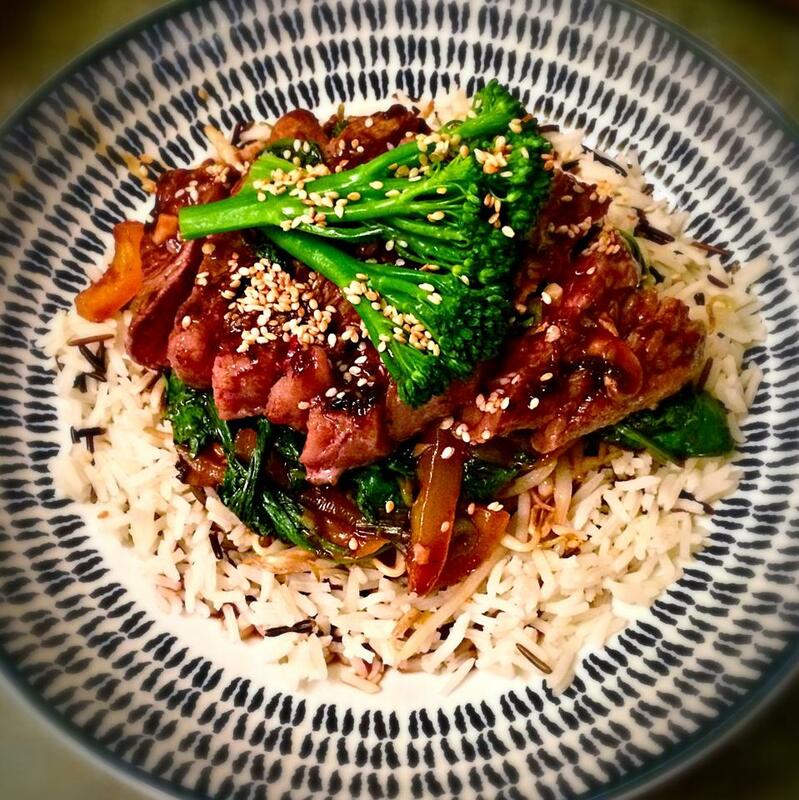 Personally I love the look of arranging a whole sliced steak on top of my stir fry but if you prefer, feel free to add the beef back to the sauce mixture at the end and toss to coat. Feel free to add any of your favourite veg to this. Next time I’m going to get some beansprouts, carrots and courgettes involved. You could replace the rice with noodles or even carrot and courgette spiralized noodles (this would lower the points to 9sp per potion). The world’s your oyster! Pop the rice on to cook in some salted boiling water. Five minutes before it is ready, pop a steamer (or colander) over the top of the pan to steam the broccoli. Next put the corn flour into a bowl or jug and add a little cold water to turn into a paste. Add the rest of the sauce ingredients a whisk together until well combined. Next, spray a large frying pan with 1kal, heat the pan and then cook the steaks to your liking. I cook them for two minutes on one side, then flip and cook for two minutes on the other side. Remove the steaks from the pan and pop onto a plate to rest. Then in the same pan, add a little of the sauce and then stir fry the chilli, peppers, spring onions and mushrooms until softened a little (2 or 3 minutes). Then add the rest of the sauce and simmer until it starts to thicken (add a little more water if it gets too thick). Turn the heat down and then add the spinach. Once wilted, add the coriander, stir through and switch off the heat. In a bowl, pop your rice in the bottom. Next using tongs, lift the veg out of the sauce and pop onto the rice. Then, slice the steak to your preferred thickness and arrange on top of the veg. Pour the sauce over the steak and then sprinkle with sesame seeds. Top the steak with the steamed broccoli. This was another delicious meal, thank you Laura. It wasn’t a quick meal but certainly worth all the effort. The flavours were awesome. Making this over the weekend instead of a take away. Absolutely love your website, have made several recipes of yours for tea this week and each has been fantastic, my other half has been loving it too – keep up the good work! I love this recipe. As you said it does get quicker once you’ve mmade it a few times. Had this for tea tonight and I have to say it tasted amazing! OH enjoyed it too as it was packed full of flavour and wasn’t chicken! Ah so pleased you liked it Emma, this is one of my favs!